Even freshmen have visions of startups at these top spots. 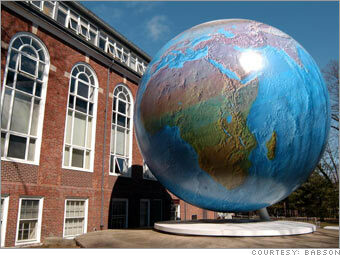 Why we chose it: Babson students live and breathe entrepreneurship. They can engage in late-night bull sessions at the E-Tower, a dorm for undergrads who are already building companies. All freshmen team up to write business plans, and then start and dissolve companies during a required yearlong program. "They study it, write about it, and do all the heavy lifting," says John Butler, professor of management at University of Texas at Austin. Across the country, other entrepreneurship educators seek to follow Babson's playbook, says Butler.